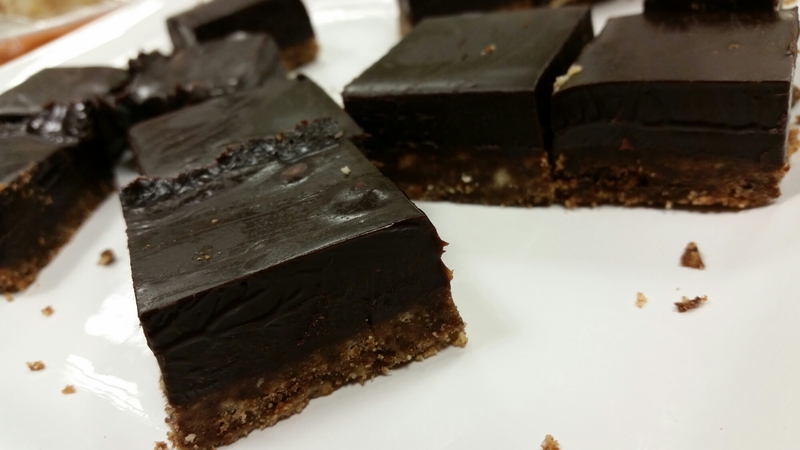 So one of my favorite go to desserts is the chocolate ganache slice. I’m not sure if you can really call it a slice, but i guess it does have a biscuit base, so lets just go with that shall we? Many, (MANY!) moons ago, I worked in the hospitality scene. I learned a thing or two in the kitchen from those stints ill tell you! But the most rewarding of gifts was a lovely apprentice chef who made a version of this for the weekly dessert. With a few modifications its been the easiest and universally loved dessert that comes out of my kitchen. If I make it for work/friends/to sell, its mandatory that I make enough to have left overs. Its happened before where I was foolish enough not to make a second one… I’m still surprised they are letting me live in the house. Anywho, I digress. If you have a spare 15 minutes, you can whip up this dark chocolatey goodness of sin. The hardest part is waiting for it to set! Here is the recipie with all you need to get this done. I will give you instructions for making your ganache in the microwave, but if you prefer a double boiler, you can do that as well. I find that the microwave is quicker, and that’s pretty much the only reason I use it. I hate wasting time! Double boiler (if you make your ganache on the stovetop). Cut butter into cubes and, in 20 second bursts, melt in microwave. Grind/smash/break up your biscuits. Have a mixture of big and small pieces if you like. Mix melted butter and biscuit pieces together until well combined and you dont have any dry bits of mixture straggling round the bottom of the bowl. Press biscuit mixture firmly into the tray using the spatula and put aside. Put your chocolate broken into small pieces into the microwave safe bowl and cover with cream. Give it a bit of a shake so that the cream settles around the chocolate. Make sure that the all the chocolate on the top of the bowl has a had cream poured over it. This is so that the chocolate doesnt burn when heating. Put it in the microwave for 1 minute bursts stirring at each interval. You will notice at about minute 3 that its quite on the way to melting, so get your wisk and combine it as much as you can. If you still have lumps, give it another 30 seconds and wisk again. Repeat until you have smooth, glossy ganache. TIP: we only want to combine the cream and chocolate, not whip it, so be gentle! Once you’re happy that your ganache is mixed, pour it over the base. Refridgerate for an hour or so until its set. I like to serve it in squares about 5cm x 5cm with a dollop of cream.